Do you make crafts and you have a popular blog and you are able to link back to our website? If yes please email us and tell us about your project and we will offer you a fabric free of charge if you have nice and popular blog and you will write minimum 300 words post to your blog and link back to our site. Would you like to write about our products? Please contact Soile and ask for a link to our photo libary. Or do you have a keen eye for photography and would you like to have curtains or bed linen for a BIG discount or possibly even free of charge? We’d just love to see more photos of our curtains or bedlinen, in a real life settings. 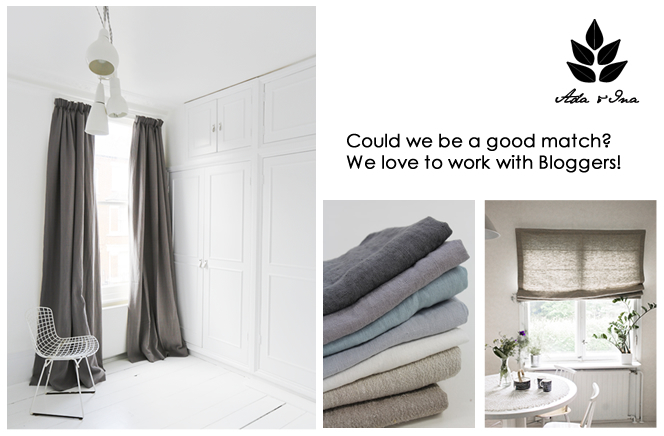 If you have a nice interior, only lacking some beautiful made to measure curtains and you are able to take professional quality photos - we would be interested in working with you. Once receiving the curtains or bed linen, you would then write a blog post of 300 words minimum on your blog with one or two links to our website. Additionally you would take at least 5 good professional quality photos of the curtains, post at least one in your blog and send all photos to us (we would get all rights for the photos). You will also share your blog post on Facebook and Instagram. The photo should be sent to us within 2 weeks after receiving the curtains and you will have to sign a form that you have given us the rights to use the photos in any way we consider fit.